I hope you are having a wonderful Friday. Since the semester just started, I had a super busy week so couldn't post until today. I was planning to write this post yesterday but I was too tired to do anything else than just laying on the couch and watching some YouTube videos. Eventually I must have fallen asleep. Tomorrow we are attending the 60th birthday of my mother in law. We have to drive around 2.5 hours from here. I am excited about the celebration but I am hoping to be able to get enough rest until Monday so the second week can start. 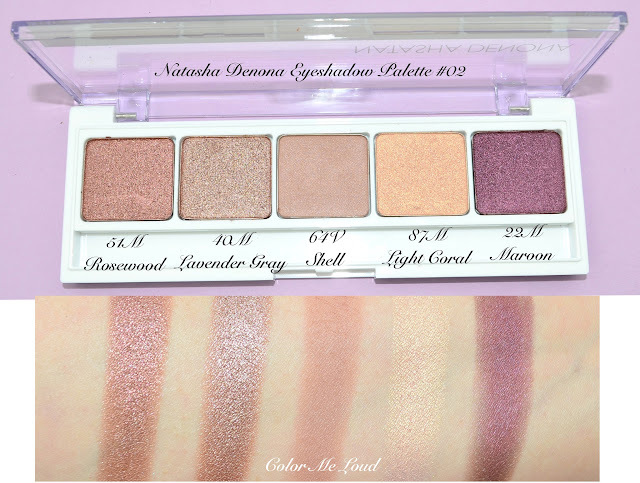 Some of you send me messages and e-mails asking if I will be reviewing Natasha Denona Eyeshadows. I ordered two of the quints, Eyeshadow Palette 5, #2 and #10 to try out and wore them multiple times during last week and weekend. I hope my thoughts are helpful for some. They are... right after the jump. Let me start with packaging. There is not too much to be said here. But let me tell first that I don't think packaging is the most important thing about a product but since I have to give you an honest impression about this one, I won't mind my language. It is plain drugstore packaging. I have seen better packaging at drugstore actually. It is cheap plastic with cheaper plexi lid which can break your nails so you have to watch out. It looks like there is no thought went to this part of the product, there is a part for a brush for example but there is no brush. Alright, so I leave it here and won't come to that again. If packaging is very important for you, it might be a deal breaker but I can live with it but I would expect something a little better for the price point. Each of the quints come with 5 x 2.5 g (0.08 Oz) of product and cost around 48 bucks (without taxes). There is a 28 pan big palette, which costs around $240. The big palette has the same pan size for each shade so if you do the maths, by ordering that one you only save $29. For me it was not worth getting all those green and blue shades on the purple palette which I would never use so I went for two of the Quints. I thought it is a good way to try them out without breaking the bank. 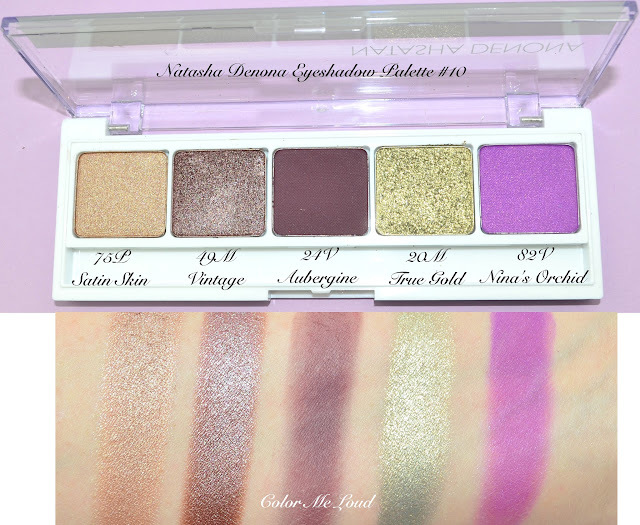 Natasha Denona Eyeshadow Palette 5 in shade 02 is a combination of purple and rose gold. Each shade has a name, which is great so that you make sure you don't get the same shade twice. Another good thing is that the quints doesn't have the shades repeating so you can get more and more quints if you like the formula without having to get a shade twice. The letters behind the shades tell (sometimes) which formula they have. I recommend you check out the singles (here, not affiliates) for that and make sure you know what you are getting. V stands usually for matte, M for metallic but some M are duo chrome or sparkling (something like glitter). 51M Rosewood, finish metallic, a mid-toned shimmery/metallic rose shade which is very wearable. 40M Lavender Gray, finish metallic, a mid-toned rosy taupe, very close to 51M Rosewood and makes me wonder why these two are in the same palette but other than that it is a lovely shade for an easy day look. The texture is lovely. 64V Shell, finish matte, a mid-toned peachy tan shade which makes a nice transition on the crease. On me this shade is a bit too warm and too dark as a transition and wished there would be a cooler and lighter shade for that. The formula is nice though and it applies and blends beautifully. 87M Light Coral, finish metallic, is a light peachy gold, which is a great shade for all over the lid if you are fair. I think this shade is making this palette very versatile and wished one of the first shades is also a bit lighter. You know, not everyone goes full on smoky during the daytime or even if you do, you would like a touch of lightness in the inner corner to open up the eyes. 22M Maroon, finish metallic, is a deep reddish purple with satin to shimmery finish. I found that this one applied on the crease nicely as well since it is not too shimmery. Maroon is another shade which makes Palette #2 more versatile and less mono-chrome. Since last week was very rainy, some of the following photos are a little dark, sorry for that. All in all these apply beautifully and are very pigmented and smooth. One of the problems I faced though is that if you would like to apply many shades at ones, this is not the best formula. It doesn't layer well. If you apply one shade, the next shade doesn't show up well. One great thing about these is that although they are very smooth and pigmented none of these crumbled on me (exception being the sparkling shades but this palette has none) and there was almost no fall out during application and later on during the day. The lasting power is also very good. Below I am wearing Shell on the crease with Maroon applied on it (but didn't show up so well because of layering problem I mentioned), Light Coral on inner corner and Rosewood on the lid. Another day I tried Lavender Grey but the shade was so close to Rosewood to ever understand the difference once applied on the lid so I didn't edit the photos. 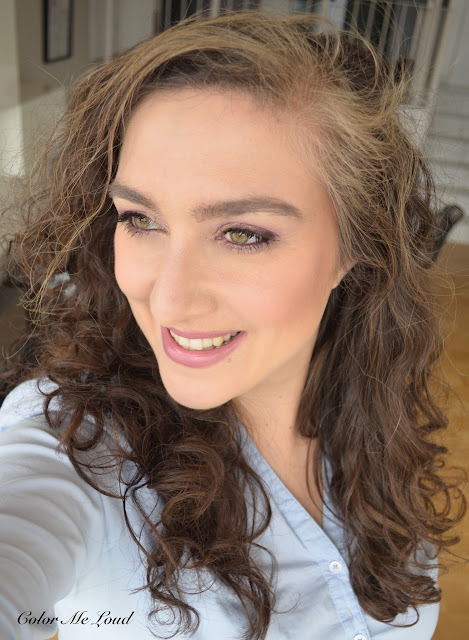 Here is the look in context with Natasha Denona Palette #2 on the eyes, Maria Galland bronzer/blush on the cheeks and Maria Galland lipstick on the lips, reviews on these coming up in a day or two so more details later on. 75P Satin Skin, finish metallic. I don't know why this one has "P" instead of M. It is a cool peachy tan shade with metallic to satin finish. This is a shade I haven't used because it almost disappears on me. I wished there would be a lighter shade in this palette to use on the inner corner instead of this one. 49M Vintage, finish duo-chrome. Although given as duo chrome, I don't see the duo chrome effect in this one but it is a gorgeous shade to apply on the lid by itself. It just really needs a lighter shade to support on the inner corner. 24V Aubergine, finish matte. It is a deep reddish brown/plum as a liner or to deepen the crease and add drama. This swatches a bit dry but I appreciate these type of shades being a little dry than them producing fall out. The consistency of this one is just right. Only that since these don't layer well, once I apply Nina's Orchid on the crease, it is very hard to add this one on top. 20M, True Gold, finish Sparkling. I wore this two times, it was a big failure the first time around since I tried to use a brush and wanted to layer on another shade. The glitter went into my eyes and they got swollen the other day. It was terrible. The second time around I picked it up with fingers and applied on the inner corner, alone, not over a shade. It was lovely. That said the result was really dramatical and all day long I was conscious of my make-up although I can really wear lots of color without looking too much. All I want to say is that, reserve this one for special occasions! 82V Nina's Orchid, finish matte. This looks scary but was very wearable (mostly since it is matte) on the crease for me. It is a purple fuchsia shade, love it. I found the matte texture to be great, no fall out and the vibrancy was preserved during the day. 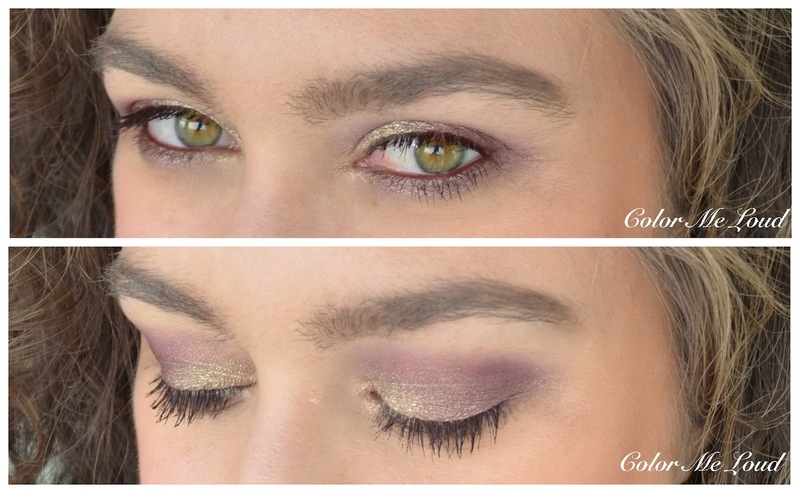 This is the make-up with True Gold on inner corner, Nina's Orchid and a touch of Aubergine on the crease and Vintage on the outer corner. This was way too sparkly for a day look. I had the feeling everyone was looking at my make-up lol. Anyway, never again haha! This is a look I loved, Nina's Orchid on the crease but this time Vintage and Satin Skin on the lid. It is more wearable and fun at the same time. I tried to add Aubergine to the outer corner but again, layering problem. In this look I am wearing Natasha Denona Eyeshadow Palette #10 on the eyes, Tom Ford Bronzer Terra and Blusher Frantic Pink on the cheeks as well as Tom Ford lipstick in Julian on the lips. This was one of my favorite looks last weekend, really loved it how it wore and photographed. Final thoughts: Check out cons and pros above to decide if Natasha Denona is right for you. I really like the texture and wished it would layer a bit better. I had such a problem with Cle de Peau (e.g. here) eyeshadow formula as well. 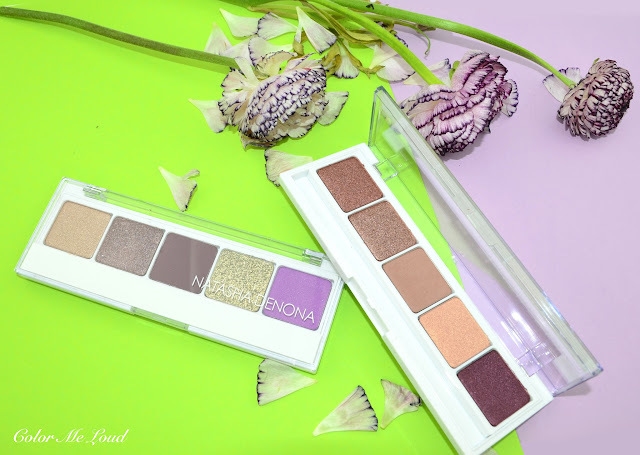 I think if you are into some color, if you like mid-toned shades without having many light shades and if you are applying one or two shades maximum on the lid without mixing too much and if you don't care about the packaging, you might like Natasha Denona. I have mixed feelings but not too bad since I ordered two more quints. Expect another review soon. 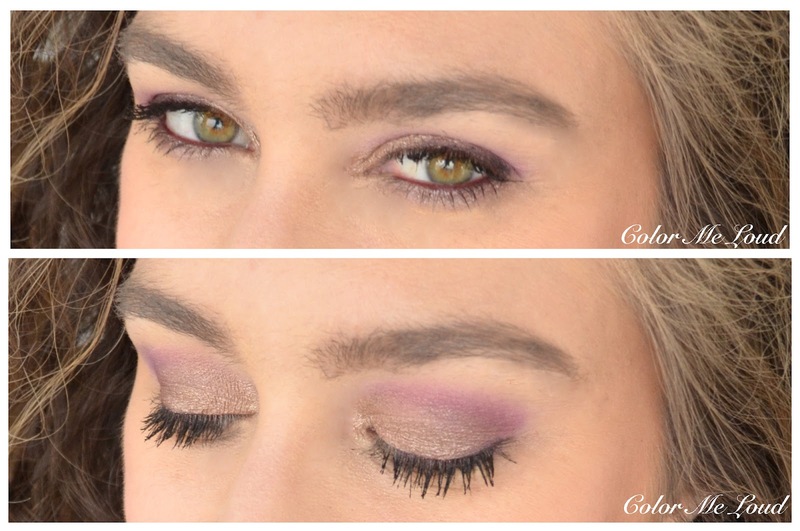 Is layering so important for your eyeshadows? Do you think a palette should have light shades to be complete? 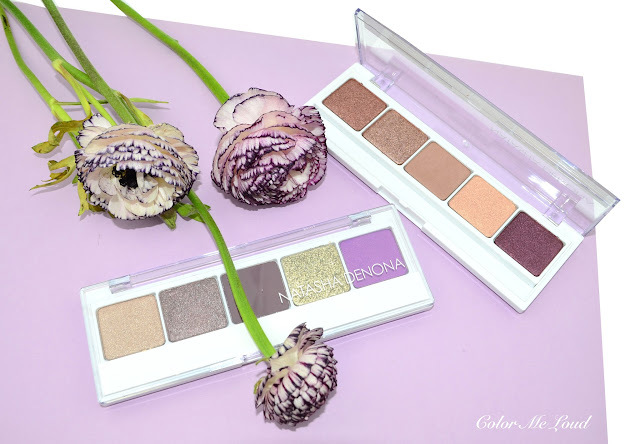 Have you tried Natasha Denona make-up yet? Hi Sara, Both palettes look so pretty on you. But I'm not really tempted. I like to be able to layer the Eyeshadows and in a palette I would want lighter shades as well. I'll save my money for Suqqu. 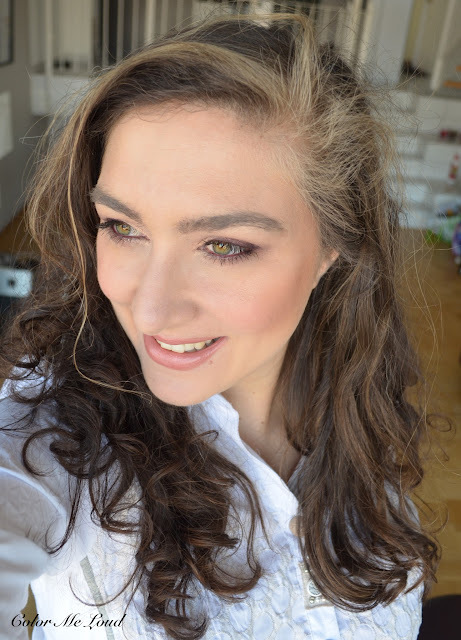 Suqqu (thanks to your introduction) and Chanel are my favourite eyeshadow formulas. However, I have heard that the new Chanel quads made in France perform poorly. They are already available in the UK and I was thinking of getting one of them but after hearing the bad reviews I'll probably skip it. 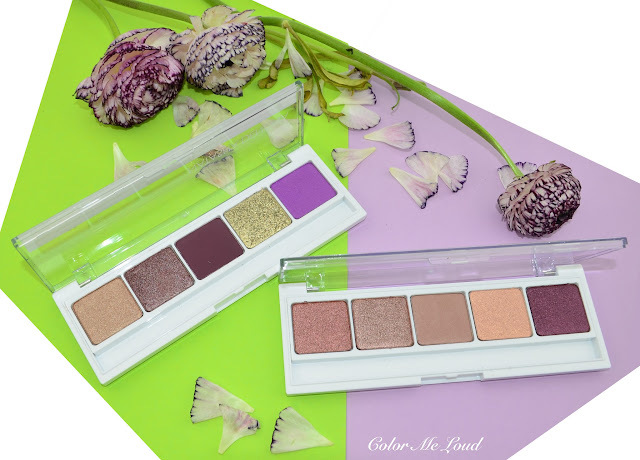 The palette #10 looks absolutely gorgeous (this orchid purple shade!) but if you can't combine shades together it's a problem for me. When I have a quint I like to use at least 3 shades together, sometimes all 5, to create a multi-dimensional look with subtle gradients, so if the shades don't mix well it really limits what I could do with them. Too bad because those colors are so vibrant and luminous. But there's also the plain, ugly packaging... so I don't think it would be worth the price for me overall! I can totally understand. The luxury experience also has other dimensions than the product itself, such as how the sales assistant is treating you or how nice the packaging is etc. I think this product is more geared towards make-up artists since they depot the eyeshadows and put them in their big palettes anyway but for me, I need some nice packaging around it too. I know what you mean about red lippies lol, ad you look go well with red! Using the Natasha Denona shades myself, I think this is a very fair and accurate review-- and the colors look gorgeous on you. I admit to having fallen for the hype. But there is something in the texture and subtlety of the hues that I just love. Also while ND does have a lot of warm shades, it has also a number of neutrals that read cool on me which I find to be rare. But I may use them differently. I tend to do a wash of an overall somewhat light color from another brand and then use the NDs in the outer corner and the crease with a metallic in the center of the eyelid. I also sometimes will mix two shades right on the brush. This makes the metallics which are awesome more wearable. I listed all the shortcomings and things which were amazing. I think the quality is au pair with luxury cosmetics and better than some others but the palettes are not put smartly together so that the versatility is not there. I am so glad you like the two of my favorite eye shadow formulas yourself too. I also like Sisley's quads but there are unfortunately only two of them. I tried the Spring quad from Chanel and the quality was very disappointing although the permanent ones were all very good, almost without an exception. I was wondering if they changed the formula but it seems they changed the producer? Too bad really! Which new Chanel eye quad are you talking about? I was waiting for your comment because you were the first person who suggested I should get some and try out. I really love these on me too if I don't try to put many layers on top of each other. I usually apply a shade on the outer corner or crease then for example deepen the crease with another shade or make the inner corner lighter but with these it is very challenging. If you mix the shades on the brush, it works because they can hold on to the eyelid after being applied. Still there are formulas you are layer and layer (Chanel, Suqqu etc.) and it works. Cli de Peau formula is nice for example but has a similar problem. as Alison mentioned above, you can combine the shades on the brush but you can't add another layer of another shade to show up after the first one is applied. I think it all depends on how we apply eyeshadows. One might like it, the other one not that much maybe. with my technique, I am not very keen on such formulas. Gradient thing that you would like to achieve could also be challenging. The colors are so lovely and they apply like a dream, well, the first one does at least ;-) Packaging might be tuned for make-up artists but if they offer it to the end users, they should have done better. I hope I did not lead you astray. Since my own eyelid shape limits some of what I do, I may not be as familiar with doing that kind of layering. Relieved to see you are ordering more. Anyway, I am going to try layering so that I can see what you are talking about. Which ones are you getting next? I'm with you Lulle. I'm all about a smooth, blended transition from one color to another which requires some overlap (layering). And, because I have a large eyelid and browbones area, I have plenty of space to play with gradients so the ability to layer shades for that all-important transition is a must for me. To me, the color created by merging is just as important as a color used on its own. It's nice that the colors can be mixed on the brush as Sara mentioned and I do frequently use that technique to get a multi-dimensional look, but that is different from blending edges with a bit of an overlap so that one color flows seamlessly into another for a smooth gradient. They are different techniques with different results. It would be nice if these shadows could do both. Hi Sara, thanks for getting this review out so quickly, I know how it can be difficult to get the energy to work on a post after a long tiring week!! I ended up buying #2, which was a least-bad selection for me after researching all the swatches I could find. I think your analysis is very aligned with what I feel.... in fact, I'd be a little bit more negative perhaps. The #10 palette looks so amazing on you, I'm surprised. That vivid purple scared me! The last look is awesome on you! I do not like the brand. I rather team up with Shiseido, where you can layer the colors and creat even further combos. That is make-up artistry for me, the unexpected, not the blunt "color". The packaging is surely a turn off. Still, one thing I must admit: The colors are great! Hi Sara, Chanel has three new quads out in the UK: Tisse Dimnesion, Tisse Essentiel and Tisse Particulier. I was tempted by Tisse Dimension by I swatched them all in the shop yesterday and they seemed quite dry especially Tisse Essentiel. They also had five new Stylo eyeshadows, whose quality seemed good as always but the colours while very nice didn't particularly wow me so I ended up getting nothing. Oh gosh I've been so out of the loop I haven't heard of this brand. I'm off to google it, and see what the deal is. LOL!